Indonesia Map is an application with high resolution maps, which are made with complete details in accordance by the state of Indonesia. There are total of 75 maps in this application, which consists of 33 maps of provinces, 5 maps of the most visited tourism objects, 13 metropolitan cities and, 5 maps of the largest island in Indonesia and there are 20 regional maps in Bali, where Bali is a province that most widely visited by tourists in every year and becomes the most popular destination worldwide. All maps in Indonesia Map application are digital map and “hand made”, which using the Vector application that being exported to the form of .Png. By the convenient that is given by Mahoni.com, all the maps in Indonesia Map can be sent or shared via email and can be printed like a conventional map. By having high resolution in every picture, a printed map will not break and remain good for printing in large sizes. By downloading Indonesia Map application, the user can directly operate it without the INTERNET connection, because it already downloaded on iPad and ready to carry while traveling. Moreover, all the facilities that exist in this application will be always updated in times, both in case of system maintenance or updating data that will also develop according to Indonesia’s update. 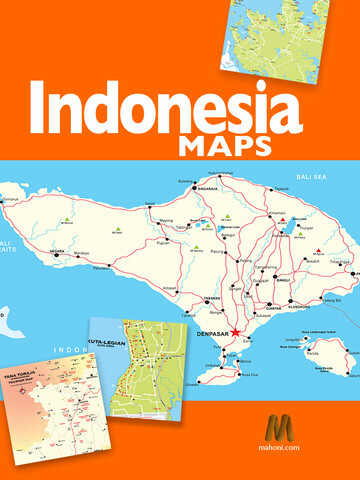 Indonesia Map is your private companion that leads you into beauty. Just come and see the beauty of Indonesia by downloading this application.